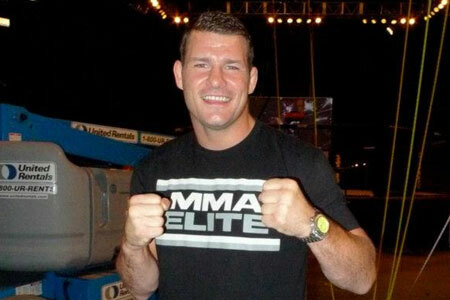 A middleweight shootout between Michael Bisping (Pictured) and Brian Stann was the third fight to air in Saturday’s “UFC 152: Jones vs. Belfort” pay-per-view broadcast. Air Canada Centre in Toronto is hosting tonight’s festivities. The show is headlined by a light heavyweight title tilt between champion Jon Jones and Vitor Belfort. Bisping has him clinched against the fence. Stann tags him with a straight right hand, but Bisping counters with a jab. Bisping working hard for a double-leg takedown, though Stann fends him off. “The Count” scores with a short elbow in the clinch, but Stann answers with a one-two combo as they separate. Stann takes a kick to the groin and time is called. Game on. Bisping now accepts a shot to the nuts. Game on. Stann tags him with three straight leg kicks, so he doesn’t seem too worried about getting taken down. Stann clocks him with a big right hand. Bisping is dazed and confused, but survives the round. Close round. Bisping gets a body lock and finally manages to slam Stann to the mat. Stann easily sweeps and is now in top position. Bisping is able to sprawl out and hits his opponent a couple of times before getting to his feet. Bisping connects on a one-two combo. He immediately picks Stann up and slams him to the ground. The Brit attempts a kimura to no avail. Bisping charges forward and easily puts Stann down again. However, Bisping can’t keep him there for long. Bisping shoots again, but can’t land the takedown. Bisping connects with a one-two-combo. Stann hasn’t done much since rocking Bisping in the opening stanza. Bisping gets one final takedown to cap off his evening.